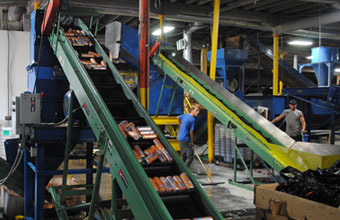 JaSar Recycling, Inc. is a family-owned business that began in 1998 with one building and two employees. We have since grown to a staff of over 60 and a 16-acre, multi-facility operation with over 300,000 square feet of warehouse space. We are a full-service recycler, specializing in the procurement, processing (including certified product destruction) and marketing of a full range of commodities. We provide in-house transportation services via our fleet of 32 tractors (including two roll-off trucks), 165 trailers (including 25 with specialized elevators), and a certified platform scale on-site. We also have carrier agreements in place with several major trucking companies. In addition to serving many local and regional firms, JaSar also works with national and international companies such as Coca-Cola, WalMart and Nestle to meet their recycling needs.